Obafemi during Ireland training this week. 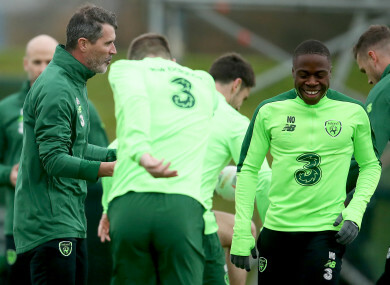 MICHAEL OBAFEMI HAS announced that he is fully-committed to representing the Republic of Ireland at senior level. The 18-year-old Southampton forward, who has two Premier League appearances for the Saints this season, has spent the week training with Martin O’Neill’s squad ahead of two games — the first of which is a friendly at home to Northern Ireland tonight. Born in Dublin, the teenager is also eligible to play for Nigeria, the nationality of his both parents, and England, where he has lived for several years. O’Neill has stressed that he would not force the player into making a rash decision and said that he won’t be bringing him to Aarhus to play Denmark in the Uefa Nations League next week. However, Obafemi’s representatives, Playerworks CSM, have released a statement to reveal that the Ireland underage international intends to stick with his birth country. “Due to current speculation surrounding Michael Obafemi and as Michael’s representatives, we would like to go on record to say that we are not in talks with either Nigeria or England, nor is it something we have ever pursued,” the statement reads, as reported by Sky Sports. “Since Mark O’Toole spotted Michael early on, he, along with the other staff at Ireland, have given Michael a great opportunity, which he has enjoyed immensely. Michael was born in Ireland, so this is the country he naturally wants to play for. “Martin O’Neill has shown great faith in Michael and he wants to repay that faith by helping the team achieve success. Email “'100% committed to Ireland' - Southampton teen releases statement on international future”. Feedback on “'100% committed to Ireland' - Southampton teen releases statement on international future”.